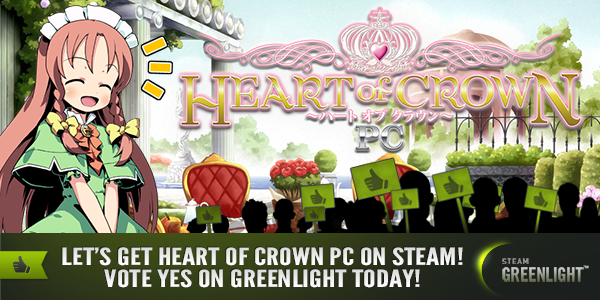 Partnership for Heart of Crown PC! Today we would like to congratulate our partners at Japanime Games and Culture Select for successfully reaching their funding goal for the Heart of Crown PC Game! Heart of Crown is an exciting deck-building card game with high-quality artwork by FlipFlops, the creators of the manga, Everyday Tales of a Cat God, and the artists for Etrian Odyssey II: The girl of six flowers, where you and other players compete to push your princess’s claim to throne and see her crowned as the new ruler. The PC version will feature all of the expansions currently being offered on Japanime Games’ Kickstarter, and offers three different modes of gameplay: online ranked play, campaign play, and free play! In ranked play, players of the PC version can compete against each other in online multiplayer matches that reproduce the physical card-game one-to-one, with added ranking lists so you can strive to be the top player! Free play will offer the same multiplayer experience, only in unranked matches. Then, using the points earned in ranked or free play, players can proceed through campaign mode, unlocking story missions, new cards, and furthering your princess’s claim to throne! While Japanime Games will be focusing on the localization of the physical game, we at MangaGamer are sponsoring the PC game’s localization by Culture Select! We’ll be working closely with Culture Select to ensure the best quality release when it hits our storefront. The PC version has just gone up on Steam Greenlight, so go give it your vote if you want to see this great game on Steam in addition to MangaGamer! Japanime Games is dedicated to bringing you the finest games from Japan and beyond! It’s our goal to import and translate the best games from Asia to bring those great games to a wider audience. Our games feature some of the finest art that can be found along with engaging gameplay and quality components. We are committed to great customer service and have hundreds of thousands of happy customers. Culture Select is a Delaware, USA based company that aims to connect the creative work of authors in limited local markets with an international audience. We strive to give smaller markets and the worldwide audience a chance to reach independent developers, free of language barriers and other restrictions. will there be a mangagamer version? After watching the video and skimming a review of the game over at BoardGameGeek.com I’ve come to the conclusion, that this is pretty much a rip-off of the grand daddy of all deck building games, Dominion. The distribution of the starting deck (7 money cards, 3 victory point cards), the costs of the victory point cards you can buy (3, 5 and 8) and even the costs of the money cards (3 for a money card worth 2 and 6 for a money card worth 3) are all the same. Although – to be fair – there seem to be certain differences, but I think I prefer the original. Heart of crown is far better than Dominion: you cannot repeat the same old combo, and the game is very balanced.